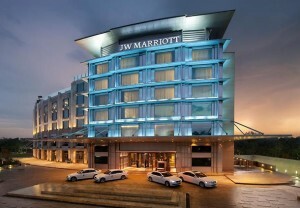 With its 5-star luxury, full-service spa, six restaurants and glittering rooftop pool, the JW Marriott Hotel Chandigarh is one of those destinations that entices visitors all year round. But travelers looking to book a summer getaway or, a little later, a holiday escape have one more reason to reserve their stay at this city-center Chandigarh hotel: The Exceptional Getaway Package. The Chandigarh hotel deal’s array of indulgences speaks to every sort of traveler, from families who want to discover area attractions like The Rock Garden of Chandigarh, to couples who want a romantic escape. Even corporate travelers can take advantage of the promotion to turn a business trip into a mini-holiday. And couples or wedding planners organizing events in Chandigarh will find this offer especially convenient, too, considering the property’s more than 8,000 square feet of beautifully appointed event space and 900-person Grand Ballroom. Located in the heart of the city’s business district, the hotel puts guests just steps from major corporations and Punjab University. Other attractions like Sukhna Lake, Pinjore Gardens and the beautifully scenic Leisure Valley are all close by as well for experiences that are as spectacular as the hotel itself. Reserve your Exceptional Getaway today with the promotional code W11!